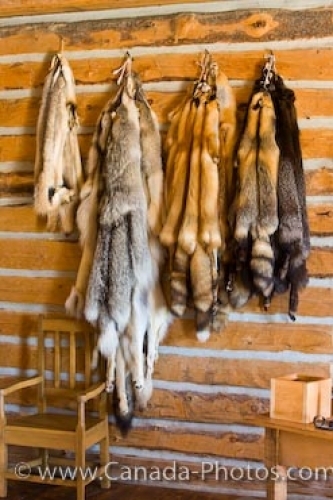 Hanging on the wall of the Master's House at the Last Mountain House Provincial Park in Saskatchewan, Canada, are a display of animal pelts belonging to various species of animals. These animal pelts come from a badger, wolf, red fox, silver fox and cross fox, all which vary in color and texture creating an intriguing wall collection. The Master's House was always kept the nicest and had the most important pieces of furnishings to make living extremely comfortable in the fur trading era. The Last Mountain House marks the end of the fur trading era throughout Saskatchewan, Canada and when visiting, interpreters are on hand to explain how people lived. The Last Mountain House was built in 1869 by the Hudson's Bay Company and the reconstructed buildings are interesting to explore along with seeing the fur trade displays. Located about 48 kilometers northwest of Regina, Saskatchewan, the Last Mountain House Provincial Park is one worth visiting to relive some of Saskatchewan's history. Picture of animal pelts at the Master's House at Last Mountain House Provincial Park, Saskatchewan. Badger, Wolf, Red Fox, Silver Fox, and Cross Fox pelts in the Master's House at the Last Mountain House Provincial Park, Saskatchewan, Canada.